sari silk, originally uploaded by All Things Mimi. Here is more yarn from my buying frenzy this morning. This is called Sari Silk, because it is made from recycled Sari fabric. The resulting yarn is irregular and varies greatly in thickness. I am using size 15 needles to knit it into a thin scarf (as you see in the pic). I may have to go pick up another hank, as the work you see constitutes half of the first hank. This is such fun to work with...I may be hooked on non-traditional fibers! 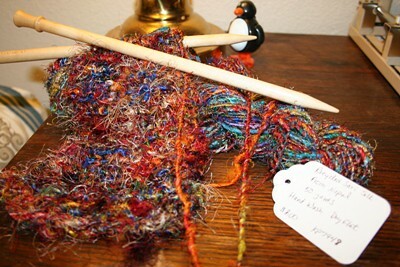 I love this yarn - its really pretty! OR you could find a super cute button and make a scarflette! Small skeins are great for that! How are the socks?